I would like to introduce you to Eileen Fisher, a socially conscious designer. Prior to researching for this post, my perception of Eileen Fisher clothes was timeless dressing, an investment spend. I have to tell you, there is so much more to this designer. Since its inception 25 years ago, Eileen Fisher used linen as a mainstay of their clothes. Now organic linen is one of their core fabrics. Also, seventy percent of the cotton used in their collections is organic cotton. In 2005, Eileen Fisher began the The Peru Project; fair wages plus organic cotton. This initiative is a movement to make Peruvian fair trade knits an increasingly important part of their collections. Around this same time, Eileen Fisher’s design team became interested in Alpaca fibers, also from Peru. Alpacas are a naturally environmentally friendly fiber. Please follow the link below to see some interesting videos from the Eileen Fisher website. Also, check out how Eileen Fisher supports women and girls through two initiatives: Activating Leadership Grant Program for Women and Girls and Women-Owned Business Program. 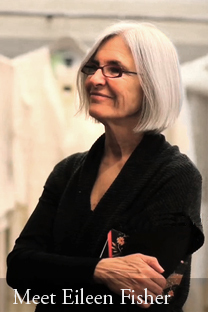 In addition, Eileen Fisher is a founding member of the SAI Corporate Program at the Signatory Level. She was the first company to roll out the SAI’s Social Fingerprint program with 6 factories they do business with in China. By being actively involved in a program of this type, Eileen Fisher demonstrates that she “Walks the Talk” relative to CSR, or as they prefer to call it, social consciousness. Let me know what you think of this exciting, socially conscious designer. This entry was posted in Uncategorized and tagged alpaca fiber, Eileen Fisher, environmentally friendly fiber, organic cotton, organic linen, Peru Chronicles, SAI, SAI Corporate Program, SAI Social Fingerprint, The Peru Program by ConstanceWC. Bookmark the permalink.